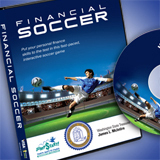 Financial Soccer is a fast-paced, multiple-choice question game, testing players' knowledge of financial management skills as they advance down field and try to score goals. Educators are encouraged to review and download the curriculum for students before actual game play. If you're already warmed up and ready to play, click the button above to begin. Attacking head on the issue of financial literacy among teens, Treasurer James L. McIntire joined Sounders FC Andrew Weber, Visa Inc. and members of Jump$tart to showcase Financial Soccer at Foster Sr. High School. The event is part of a statewide effort to improve teens' money management skills statewide with Visa's free, FIFA World Cup™ branded educational video game. Read more. Play the game.